Jazz musicians, like their classical counterparts, generally aspire to virtuosity in technical execution and musical expression. The demands of improvisation require that jazz students develop a parallel virtuosity in the use of many aspects of music theory, a finding indicated in studies by Charles Ciorba, Patrice Madura, and Lissa May. As suggested by Garrett Michaelsen, improvisation itself builds theoretical fluency as it requires the real time use of theoretical knowledge. Jazz pedagogy fosters this fluency by employing harmonic, melodic, and voice-leading analysis in activities meant to develop an improviser’s melodic vocabulary and improve his or her ability to express harmony through melody. These learning activities include the transcription, analysis, segmentation, memorization, and transposition of content from improvised solos. This preparation leads to creative activities, which include composition based on melodic and harmonic content from the existing solo, improvisation similarly based on existing content, and improvisation of new melodic material over the chord changes of the solo. In this essay, I will refer to transcription, analysis, segmentation, memorization, transposition, and subsequent composition and improvisation as “transcription–application pedagogy.” As I will demonstrate, this approach offers multiple benefits including a combined aural, kinesthetic, and intellectual comprehension of musical concepts, which results from students’ engagement with theory through musical performance. This method and its practical applications and benefits will appeal to many students. First, the method provides practice in aural and analytical methods of memorization. Second, it improves harmonic flexibility and expands the pool of melodic vocabulary drawn from when improvising. Third, in working toward fluid command and comprehension of idiomatic vocabulary, it benefits the performance of music in a given style. Fourth, and perhaps most important, many of these activities strengthen the relationship between audiation and instrumental or vocal execution, which, as Robert Woody has outlined, contributes to success in memorized performance, traditional rehearsed performance with notation, sight reading, and improvisation. I will include an example of the approach at work to demonstrate each learning activity and its relevance to learning music theory. Figure 1. Transcription of the second chorus of Sonny Stitt’s solo on “Dig Dr. Woody.” Transcription by author. Corresponding audio for this example is linked here. After completing the transcription, we begin analyzing it. Students identify chord tones and recognize melodic features such as passing tones, neighbor tones, and delayed resolutions. Basic analysis along these lines reinforces the students’ knowledge of fundamentals and strengthens their grasp of how a melodic line communicates the harmony. I also have students identify the underlying voice-leading pathways of common progressions, which can later be elaborated in improvisation. The unfolding of scale degrees 6–5–4–3 in the ii–V–I in D minor and 5–4–3 in the ii–V–I C minor in mm. 7–9 of Figure 1 are good examples of idiomatic voice-leading paths. In the the next step, we begin to segment the solo, breaking up longer phrases into smaller chunks streamlined for use in improvisation. Typically, segments are based on common harmonic progressions, such as the ii–V leading to IV7 in mm. 4–5 or the series of ii–Vs in mm. 7–9 (see Figure 2). As students work with these segments in subsequent activities that require recognizing the inferred harmonies, they begin to internalize the idiomatic progressions. Another method of segmentation that is particularly helpful for improvisation is identifying short melodic segments. In his landmark dissertation on Charlie Parker, Thomas Owens suggested that one of the primary processes in improvisation consists of drawing on motives. Although not stated directly, his catalog of motives and annotated transcriptions show that these short ideas are typically between three and ten pitches in length. While practical for verbatim and near-verbatim use in improvisation, these short segments can also be designed to focus on specific melodic functions. For example, I would select segments consisting of the incomplete neighbor tones and resolution in m. 3 and the ascending major arpeggio with added sixth and incomplete neighbor tones in m. 7 (see Figure 2). Working with melodic functions like these help students more quickly understand the relationship between a melody and its underlying harmony. Additionally, the identified embellishments can be abstracted and applied over other chord types in improvisation. For example, the incomplete neighbor tones decorating the chordal fifth in measure 3 could be applied to other harmonies besides the dominant seventh chord, such as major and minor tonic chords. In preparation for transposing the segments, I have students memorize them using scale degrees while also recognizing which scale degrees represent chord tones in each chord. When applicable, we use the scale degrees of the tonicized key. For example, in the segment from mm. 4–5, we would use scale degrees from E♭ major. In the more complicated segment in mm. 7–9, we would start with scale degrees in D minor and switch to scale degrees in C minor at the D minor chord, interpreting the F as both scale degree 3 in D minor and 4 in C minor. Using scale degrees gives students a straightforward method of abstracting pitch information and facilitating transposition. Once students have extracted melodic segments from a solo and have translated them into scale degrees, they practice each segment by memory in all twelve keys. 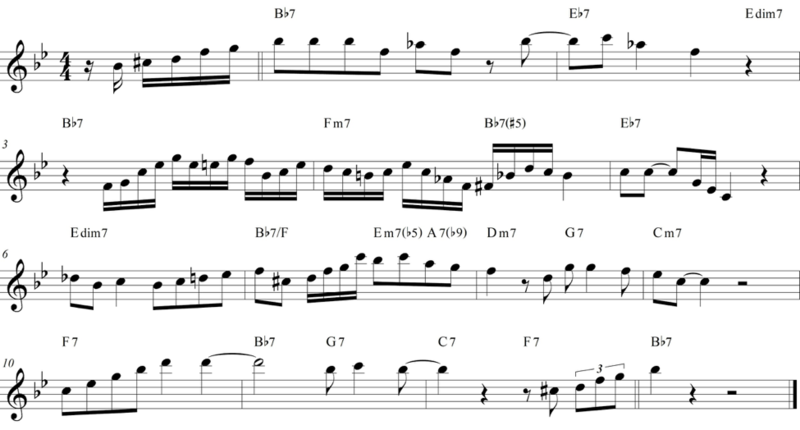 This type of practice is typical of jazz pedagogy because it helps students develop proficiency and vocabulary in less common keys, which in turn helps prepare them to improvise over any harmony that comes their way. As students learn to play the material comfortably in more and more keys, they increase their potential flexibility for incorporating the material when improvising. This process is also central to working toward theoretical fluency as it ingrains fundamentals like chord spellings and harmonic progressions in each key. Transposing also encourages students to think through their analysis in each key, further honing their ability to recognize the harmonic implications of a melody. Having gained familiarity with the content through transcription, analysis, segmentation, and transposition, students are now prepared to begin experimenting with it in creative contexts. As a beginning step, I have them compose modified or embellished versions of the material, similar to what David Liebman has suggested. While they may change many of its rhythmic and melodic aspects, when working with the harmonically derived segments, I instruct students to preserve the melodic line’s underlying voice-leading pathways we identified earlier. Modifying the material through composition offers students the opportunity to work through an improvisatory task at a slower pace, preparing them to use the same skills in real time. Following this, they improvise with the melodic content over the blues progression. I first have them focus their improvisations on embellishing the content they have transcribed, while also maintaining the structurally essential voice leading of the longer segments. As students grow increasingly comfortable they branch out into more original improvisations. These last activities are musically rewarding and offer significant opportunities to further apply theoretical knowledge. Due to the effectiveness transcription–application pedagogy has proven in helping jazz students internalize theoretical and aural aspects of melodic and harmonic vocabulary, I propose that the same activities could be applied to teaching melodic and harmonic vocabulary in common-practice styles. The following adaptation of the approach applies each of the activities suggested above to learning the cadential 6/4 chord. An effective passage for teaching the cadential 6/4 is the cadence of the second theme in the first movement of Mozart’s Piano Sonata No. 16 in C Major (see Figure 3, though students would only be provided with an audio clip). Because both the melody and accompaniment are monophonic, both parts can be easily adapted to many instruments and voice. Figure 3. Measures 24–26 of the first movement of Mozart’s Piano Sonata No. 16 in C Major (K. 545). Corresponding audio for this figure is linked here. First, I would assign students to listen to an audio excerpt containing the measures and learn to sing the melodic line with and without the recording. To help students quickly grasp the harmonic implications of the melodic line, I would either assign a transcription of the left hand accompaniment or provide notation of just the accompaniment, based on the class’s ability (see Figure 4). Students would next complete a Roman-numeral and figured-bass analysis. I would also assign them to learn to play and sing the accompaniment from memory. With these supporting activities completed, students would now be prepared to transcribe the melodic line. Figure 4. Left-hand accompaniment of mm. 24–26 of Mozart’s Piano Sonata K.545. Following transcription, I would have students complete an analysis of the transcribed material. They would analyze which scale degrees represent chord tones within each harmony and determine the melodic functions of the remaining pitches (e.g. passing and neighboring motion). Important voice-leading tendencies would also be included in the analysis. Additionally, we would identify the structurally important pitches of the melody, which would later be used as an aid in composition and improvisation (see Figure 5). Another aural activity reinforcing all of the above would be to sing through both the melodic line and accompaniment on scale degrees or solfège syllables. Figure 5. Structurally important pitches of the melody. Guide for composed or improvised embellishment. With an analysis in hand, students would be prepared to begin practicing transpositions of the passage on their respective instruments. I would instruct students to practice transpositions around the circle of fifths, which discourages intervallically transposing each note from one key to the next, thereby encouraging them think in terms of scale degrees. Both the melodic line and accompaniment would be assigned. I would typically require that students practice melodic segments in all twelve keys, though this requirement could be adapted to the class’s skill level. 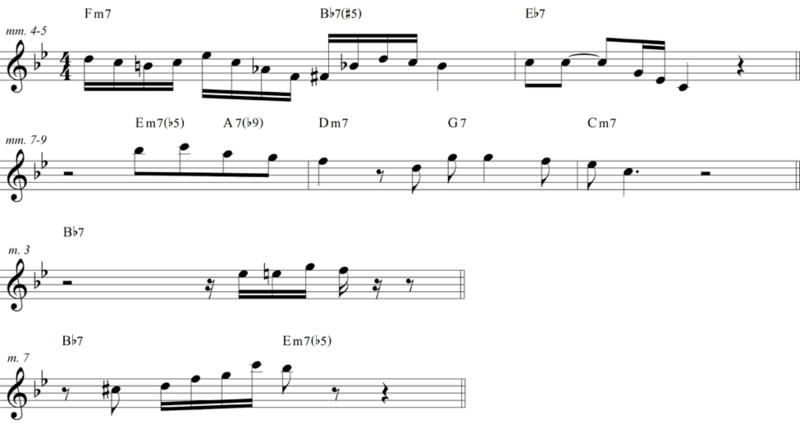 Unlike the blues transcription, this example is already a focused segment of music. As transcription can be a time-consuming process and theory curricula typically address one harmonic concept at a time, I would suggest assigning shorter transcriptions that target the relevant concept. Within these transcriptions I would also pick out and assign additional smaller segments which drill the melodic functions of dissonances and thereby reinforce basic chord spellings, similar to the shorter segments from the blues transcription. From our cadential 6/4 excerpt, I would assign the shorter segment below which begins on an accented dissonance, a note students might otherwise play without mentally processing its relationship to the cadential 6/4. Figure 6. Short melodic segment beginning on a dissonance. Once students are sufficiently adept at transcription, analysis, and transposition, I would assign them to compose an embellished version of the melodic line using the structurally important notes and related voice-leading as a guide (given in Figure 5 above). Giving them specific melodic parameters such as working with passing tones or appoggiaturas provides focus and direction. Depending on the skill level of the class, they can be given greater or lesser latitude in this pursuit. As in the previous activities, I would assign students to practice this new material in twelve keys. Finally, I would assign students to improvise harmonically clear melodic content over the accompaniment. An appropriate first step would be to simply embellish the melody in real time. Basic parameters would be provided such as resolving the sixth in the cadential 6/4 to either the seventh or fifth as the V7 arrives. As above, I would instruct inexperienced students to use particular melodic elements like passing or neighboring motion; students with more improvising experience and sufficient command of the harmony would be given more latitude. A basic looped audio accompaniment would be provided with Roman numeral notation as preparation for in-class improvisation. Depending on ability, I might assign other keys for improvisation and provide looped accompaniments for those as well. Figure 7. Roman numeral notation for improvisation. With limited time resources, it will not always be practical to incorporate all of the above, but a number of relevant benefits would come from including the core activities of transcribing the passage, memorizing its scale degrees and Roman numeral analysis, transposing the material to other keys, and applying it creatively through composition or improvisation. Students will have gained the ability to more quickly identify and construct the cadential 6/4 in various keys and reference their kinesthetic memory in moments of analytical doubt. They will also have an improved ability to recognize the cadential 6/4 aurally. Zooming out to a broader perspective, this kind of command over fundamental harmonic vocabulary and its melodic realization will facilitate subsequent analytical activities, like examining phrase structure and form, which often require harmonic analysis as a preliminary step. Transcription–application pedagogy opens the door to more extended settings for improvisation in a music theory class. One of the many possibilities would be to supplement composition assignments—which are often a kind of final project for the semester—with an improvisation component. For example, if students were assigned to compose a piece with a modulating continuous-binary form, they could be provided scores and recordings of several such forms, and audio tracks which included only the harmonic accompaniment. Students would listen to the recordings and provide a basic Roman numeral analysis of each binary form. They would then use the notated scores and accompaniment tracks to first embellish the melody and then improvise new melodic content over the form. This would help students internalize formal conventions and prepare them aurally and intellectually for composition, and it would serve as a culmination of the transcription–application activities they had worked on throughout the semester. Other applications of improvisation might include a theme and variations approach using a familiar melody and harmonic progression, improvisation over an ostinato like a chaconne bass, or even using typical progressions drawn from jazz or popular music. When given appropriate harmonic and formal parameters, these exercises would go a long way towards reinforcing curricular content and skills. These extended applications and the typical transcription–application activities together illustrate the many ways that this approach enables students to engage with theory both musically and intellectually. The method incorporates many domains, including aural skills, analysis, performance, composition, and improvisation, and it employs them to build students’ fluency in spelling chords, recognizing and constructing idiomatic chord progressions, and understanding the harmonic implications of melody. The method’s effectiveness in teaching theory and its potential to build musicianship make it a prime candidate for adoption in the theory classroom. This work is copyright ⓒ2016 Ben Britton and licensed under a Creative Commons Attribution–ShareAlike 3.0 Unported License.